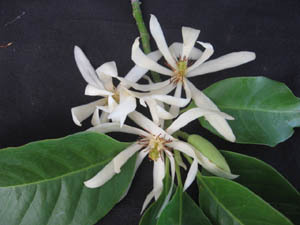 Must have tree for tropical locations with an amazing fragrance. You can see flowers year round on mature trees grown outside. 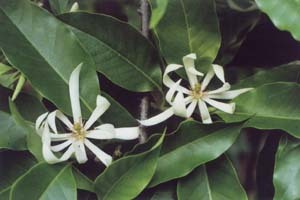 Other common names for this tree are: White Champak, Pak-Ian, Fragrant Himalayan Champaca, Joy Perfume Tree, White Sandalwood. You may wonder what is the different between the alba and the M. champaca? Besides the most obvious, color of the flower, there are a few differences. The M. champaca has velvety leaves while the M. alba does not. The fragrance of the flowers are also different. Both are very pleasant, strong fragrances. In our opinion, M. champaca has a floral scent. 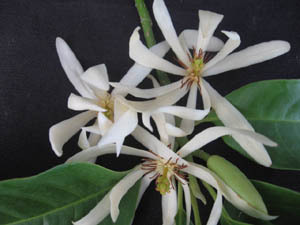 M. alba has a floral scent with a hint of fruity. Both are tropical trees that can get big if you let it and they require the same treatment and conditions. M. alba is often harder to find for sale than the M. champaca. MIN. TEMP. : high 20's for short period of time. young trees should be protected from freezing temperatures.